The Museum of Motherhood (M.O.M.) is an exhibition and education center dedicated to the exploration of family – past, present, and future. We highlight the many roles of women throughout history and in contemporary culture. In our museum space we provide mothers, fathers, youth, caregivers, and mothers-to-be insights into what they will experience as parents and how to handle it. We educate them about the emotional and physical aspects of child rearing, exposing them to different global traditions, and giving them insights into the context of mothering in the social sphere in which mothering is done. Institutions can create a positive sense of community and an increased sense of connectedness. We share library books, films, collaborative art projects, and conferences, often at little or no cost to make cultural literacy available to those who might not otherwise have access to these types of resources. The need for M.O.M. is highlighted by the work of the feminist movement, the gender agenda, and global women’s health initiatives. Precedence for M.O.M. has been established through the initiatives of the National Women’s Hall of Fame, the International Museum Of Women and the First Ladies’ Library. They are all positive contributors to expanding education about women in history. But our intense focus on the motherhood, fatherhood and caregiving roles opens the conversation to unlimited opportunities for exploration and documentation within the sphere of procreation and sustainability, not to mention how humanity hopes to evolve. The development of a “Motherhood Movement” during the last twenty years as well as other mother-related literature and the explosion of “Mom Blogs” and awareness of the “Mommy Wars”, have impacted the vast social, economic, and cultural landscape. Thus, the expanded museum exhibit space and educational facility that we envision will be eminently worthwhile. Together we will be putting the subject of motherhood and family on the map. Our long-term goals include the acquisition of a permanent physical space to house M.O.M. as we continue to develop our traveling exhibits and online initiatives, which include courses in Mother Studies, the MOM Directory, and the student run, Institute For Family Research and Development. The purpose of this conference focuses on “new maternalisms” and explores “motherwork” and the invisible labor of caregiving in our everyday lived experiences. How do mothers, fathers, and caretakers experience “motherwork” what does it mean? How does “motherwork” impact the communities in which we live and work? What caregiving practices are pursued in “motherwork”? How have these practices been shaped by factors such as nation, religion, gender, and other axes of difference? 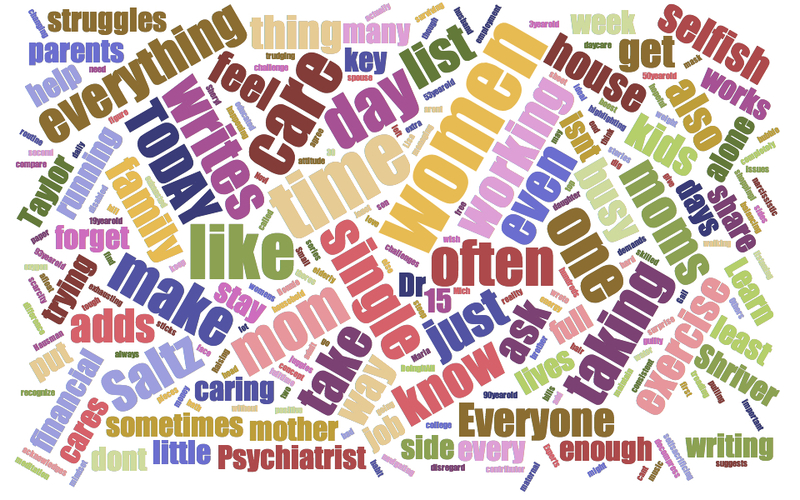 How do caregivers frame/understand their “motherwork”? What alliances do caregivers build locally, regionally, and internationally, and why? To what extent does caregiving intersect with other forms of activism/resistance? How have wo/men’s identities as caregivers been disrupted or shaped by binaries, such as east/west, north/south? Whose agency is privileged or obscured within “motherwork”? How do global discourses shape local “motherwork,” and, how, in turn, do local issues and frames shape global discourses around “motherwork”? This Call For Papers signals the important sociological and anthropological shifts taking place in the field of motherhood as it relates to wo/men – mothers, father, and caretakers. We welcome submissions from scholars, students, activists, artists, community agencies, service providers, journalists, mothers and others who work or research in this area. Cross-cultural, historical, and comparative work is encouraged. We also encourage a variety of types of submissions including individual academic papers from all disciplines, proposals for panels, creative submissions, performances, storytelling, visual arts, film, music, audio, and other alternative formats. Submissions must include a title and a maximum 50-100 word abstract for individual papers, panels, and other submission types (e.g. performance, media, music). Panel submissions must include short abstracts (50-100 word) for each individual paper that will be included in the panel. All submissions will be peer reviewed with responses by Feb. 2nd. The conference will be held in NYC at the CUNY Graduate Center and Manhattan College. [LINK] to Submit. Martha Joy Rose has been at the Graduate Center in New York City exploring the subject of motherhood through the Digital Humanities. You can see her blog at the CUNY Commons (CLICK HERE). If you have something to add, please contact Ms. Rose directly: MOMmuseum@gmail.com. 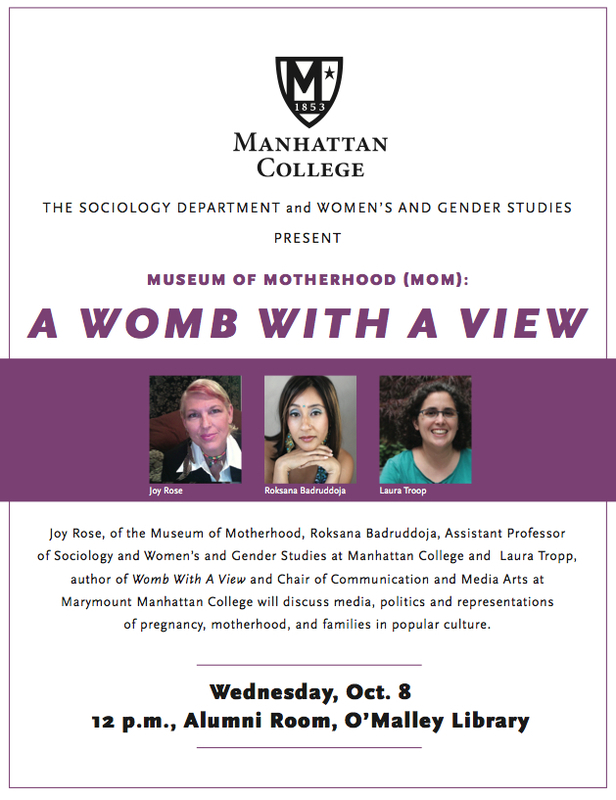 On October 8th, Martha Joy Rose, Roksana Badaruddoja, and Laura Tropp discussed media, politics and representations of pregnancy, motherhood, and families in popular culture at Manhattan College. A curated exhibit is on display in the O’Malley Library, designed and executed by Ms. Rose. Two weeks ago she submitted a proposal for an “Individualized Studies” program where she is currently enrolled in a Masters of Liberal Studies at The Graduate Center of NYC. The individualized study is in “Mother Studies.”The program is designed by Ms. Rose and supervised by Dr. Barbara Katz Rothman.